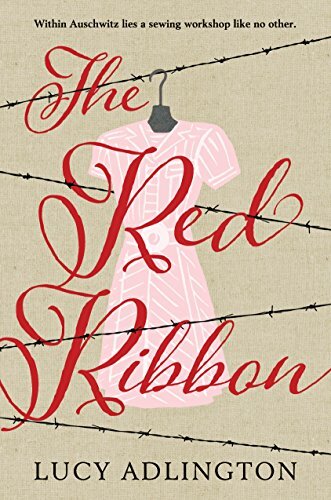 Aimed at a YA audience, Lucy Adlington’s The Red Ribbon is inspired by the real-life seamstresses of Auschwitz who were part of a dressmaking operation called the Upper Tailoring Studio. There, prisoners with superior sewing skills had a chance to avoid the gas chambers and hard labor by turning out fashionable clothing for the wives of the Nazi officers who oversaw the camp. The narrator of The Red Ribbon is Ella, a 14-year-old Jewish girl with a talent for dress-making snatched up on her way home from school and sent to Birchwood (the author’s name for Birkenau-Auschwitz). There, she’s stripped, literally, of all of her belongings, her hair is shorn, and she becomes a “Stripey,” one of thousands of prisoners dehumanized by the striped uniforms they’re forced to wear. The book opens as Ella, whose grandmother taught her to sew, talks her way into a job at the Upper Tailoring Studio. Eventually she realizes that the reason for “openings” is the death of previous workers. At the Upper Tailoring Studio, Ella meets Rose, Marta, and Carla. Rose, a fellow prisoner, has a talent for embroidery and storytelling. Marta, who oversees the workshop, is a seemingly hard-hearted prisoner who has risen to the ranks of what is called a “prominent” (a prisoner with special privileges) by relentless bullying of the workers. Carla is a young Nazi guard impressed by Ella’s dressmaking skills who alternates between confiding in Ella and brutalizing her. Rose and Ella become best friends. Opposites, Rose lives in a land of make-believe to distract herself from the harsh realities of Birchwood while Ella throws herself into the challenges of dressmaking. “Look down at your sewing,” she tells herself, “not up at the chimneys.” In places, the author intimates that Ella and Rose may be more than friends, which is a bit distracting. Selfish Marta would always sacrifice others to survive. But kind-hearted Rose would sacrifice herself. Ella must learn to balance these approaches, a life-lesson for young readers no matter the time or place. Ella also learns the consequences of taking risks, for instance when she boldly ties a red ribbon Rose gave her around her neck to distinguish herself from the other Stripeys. The horrors of a concentration camp are not the focus of The Red Ribbon. Rather, the author provides glimpses into the brutalities, horrible conditions, and lack of food, warm clothing, and medical care. But in the background, the chimneys are always smoking, and the air is thick with ash. The voice is modern, presumably so younger readers can relate to Ella and Rose. For instance, impatient to eat mushrooms they’ve found, Ella asks, “so can we flippin’ eat them or not?” For older readers, it may take getting used to given the time period. The Red Ribbon is a valuable contribution to our understanding of the Holocaust. Through Ella, Rose, Marta, and Carla, the novel deftly makes the little known tragedy of the seamstresses of Auschwitz accessible to young adult readers while exploring the complexities of human nature, good, evil, and the gray areas in between. Ella is a strong, resourceful, and sometimes impulsive character readers will root for and remember long after finishing the book. Judithe Little is the author of the award-winning historical novel, Wickwythe Hall.